Alicen wrote in asking us to address the topics of continuationism and cessationism, so here we go! 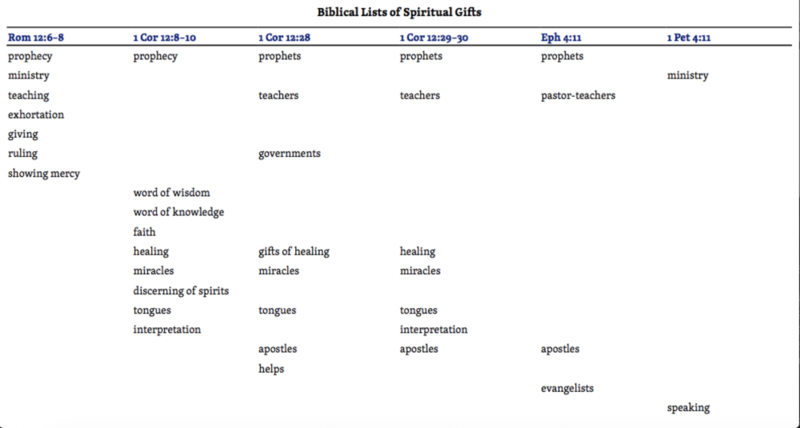 In a nutshell, continuationists believe that the miraculous spiritual gifts (speaking in tongues, prophesy, healings, etc.) continue on today, while cessationists believe they have ceased, or stopped. There’s so much great material out there on these topics, so we’ll simply drop the John Frame quote (as quoted in the podcast) below and reference a few simple articles. We encourage you to read those articles, grab some good books on the topic, and spend some time pouring over the Scriptures. I believe that miracle in a broad sense (that is, providence) continues, and I am not skeptical of reports from reliable witnesses of more spectacular miracles. But I do not think that spectacular miracles are a normal part of the Christian life. Miracles are rare today because God has no sufficient reason to make them frequent. Since Jesus has accomplished redemption once for all, the next great manifestation of divine power will be seen at his return. Until then, there is no comparable reason for spectacular divine acts. And there is no reason why we should expect God to bless us with more spectacular displays of his power than were seen, for example, in the four hundred years between Joseph and Moses. Beyond that general consideration, there is a pattern in Scripture, in which the extraordinary serves as preparation for the ordinary. We often value spectacular experience over day-to-day routine. But God’s priorities are different. During the Flood, God protected Noah and his family supernaturally, by directing them to build the ark and providing their means of life. But God’s intent was not for them to live in the ark forever, but to resume a normal life on land. So, following this most extraordinary event comes a covenant in which God promises regular seasons: seedtime and harvest, cold and heat, summer and winter, day and night (Gen. 8:22). When men shed blood, they will be punished, not by a supernatural flood, but by human government (9:6). The extraordinary, then, is a preparation for the ordinary. Similarly, in Joshua 5:12, we learn that when Israel entered the Promised Land, the manna ceased. The manna was a miraculous provision of God to feed his people in the wilderness. But his intent was not for them to live on manna forever, but to set up farms, plant crops, and eat food made the normal way. The time of manna was preparation; the normal harvests were the fulfillment of God’s promise. In John 16:7, Jesus tells the disciples that it will be better for them if he leaves the earth. That is a hard saying. The disciples experienced something wonderful in the personal ministry of Jesus, not least a great number of miracles that met their needs and confirmed their faith. But when Jesus departs, he will send the Holy Spirit, who will empower his disciples and enable them to do “even greater things” than he himself did in his earthly ministry (14:12). Through the power of the Spirit, the church will spread throughout the earth. But the age of the Spirit (after the apostolic period begins it) will be a time in which spectacular miracles are scarce. Again, the extraordinary is preparation for the ordinary. First Corinthians 13 warns us, as it did the Corinthians, against thinking too highly of the spectacular. Paul tells them that tongues and prophecy are far less important than love. The purpose of the spectacular gifts is to establish an “ordinary” one, the one that always remains—love. The church was originally governed by the apostles, who were specifically called by Christ and given miraculous gifts of the Spirit. But in the later sections of the New Testament, we learn that the churches established by the apostles were to be governed by elders and deacons (see 1 Tim. 3:1-13; Titus 1:5-9), whose qualifications were not to be spectacular powers, but godly character and ability to teach. Again, the extraordinary prepares for the ordinary. So we are not to lust after more and more signs (Matt. 12:38-42), nor should we assume that the people need special signs in order to be persuaded of the truth of the gospel, for God’s written words in Scripture are sufficient (Luke 16:19-31). For these reasons, we should not be surprised or unhappy that God has not provided more spectacular miracles in our own time. Miracles tend to set the stage for a time of “natural” existence. With that ordinariness we should be content and thankful. At the same time, we should not be skeptical about reports of spectacular miracles today. God may have his reasons for occasionally performing them. If we are to be semicessationists, we should also be semicontinuationists. For example, there are tribes and nations to whom the gospel is new. It may very well be that when the gospel is brought to them, as in the book of Acts, God sometimes performs wonders to accredit his missionaries, to defeat opposition to the gospel, and to put the new church on a firm footing. Whether such events take place depends on God’s sovereign purposes, not our theological generalizations. I have also heard reports of God dealing in wondrous ways with believers in Western society—especially with those who are recent converts: striking answers to prayer, healings that defy medical expectations, amazing timing of events, and so on. Again, I am not particularly skeptical about these reports. Nor am I disappointed that I don’t see such amazing things in my own life. When young Christians become more mature, they often wonder why such things happen to them less often or not at all. They worry that their faith has grown dim, because they don’t see as many supernatural events in their lives. That may be so, but it may also be the case that in their individual lives, as often in Scripture, the extraordinary has been a preparation for the ordinary. It is important to keep an open mind about the possibility of miracles in our time, even though their rarity should not surprise us. We have seen that the ordinary is primary. But it is also important to remember the continuities that exist between our time and that of the apostles. This is still God’s world, a world directed by a person, not by impersonal “natural laws.” He rules the world to bring good to his people and glory to himself, and nothing forces him to restrict his actions to “natural means,” however those be defined. It is also the case that Jesus still lives, and that his Spirit is still working in awesome power. Paul prays that the Ephesians may know God’s “incomparably great power for us who believe. That power is like the working of his mighty strength, which he exerted in Christ when he raised him from the dead and seated him at his right hand in the heavenly realms” (1:19-20). This prayer does not expire at the end of the apostolic age. Like Paul, we live in a time when the resurrection power of God is reaching out to bring salvation to the ends of the earth. And so God for us is “able to do immeasurably more than all we ask or imagine, according to his power that is at work within us” (3:20). The rarity of spectacular events does not mean the absence of divine power in the church. And the presence of divine power means that the spectacular may occasionally intrude into our lives. Let us not be so sure that we know what God is or is not going to do. A proper study of miracle should encourage intellectual and spiritual humility.